5 Stars to Mickey Bars - What is it?? As most of you know, I've had the great, incredible, magical luck to have been selected to the 2010 Disney World Moms Panel. Of course you know - 'cause I just refuse to shut up about it! Well, folks, the cosmos have magically aligned again! 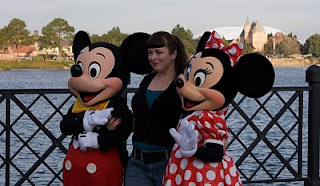 Fellow panelist Amy and I will be attending the 5 Stars to Mickey Bars cuisine and lifestyle event being held at Walt Disney World from April 23rd to 25th! Can you think of a better match? Me, Disney and Food. Sounds like the perfect trifecta to me! "What is it exactly?" you ask?? Well, those magic-makers at Disney always like to add a bit of pixie dust to each event by keeping some details a surprise, so I don't everything! But the essence of the trip is a showcase of the staggering breadth of dining experiences at Walt Disney World. There are options for every palette, budget and age range! Preliminary details show that we'll be dining with THE Characters at Cape May at the Beach Club, enjoying an truly immersive dinner experience at the Hoop Dee Doo Musical Revue, and breakfast at Disney World's newest restaurant: Iron Chef Cat Cora's Kouzzina. If that's not enough to make us drool, we're also given the tantalizing teaser of dinner "around the Boardwalk and Epcot's World Showcase" on our arrival night. Could that possibly be dinner, courses, meals at MORE than one restaurant in a single night? What will be in store for us??? AND Darn!! I'm hungry again... Greek omelet anyone?? Stay tuned... the count down is on! In less than a week I'll be eating my way through Walt Disney World! PS - To follow along live at the event, be sure to follow my Twitter list of attendees! Sounds awesome! Can't wait to follow along! How awesome! My husband (a chef) and me (an media member/Web editor) arrive Saturday morning for our 1st anniversary (which is the 25th). Maybe I will stalk you guys. If you see me - please say hi! I'll be the one in PINK! !